This post, written by Jessica Mota, was originally published [pt] on 21 August 2013 by Brazilian investigative news organization Agência Pública as part of the series on #PatrimônioAmeaçado (Threatened Heritage, in Portuguese). 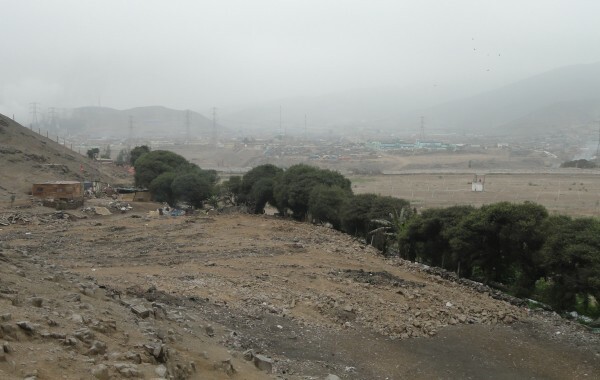 It was four o’clock in the afternoon of a Saturday, 29 June when Estequilla Rosales, a 51-year-old Peruvian, heard a noise coming from the other side of the archaeological site she knew very well. As vice president of the association Kapaq Sumaq Ayllu [sp], for 14 years she has been responsible for helping to protect a national cultural heritage in Peru, the 45-hectare Archaeological Complex of El Paraíso, one of the largest and oldest in Peru. It is in that spot that she spends her days. And it was nearby, on the Santa Josefina hill, that she built her house. The noise was coming from something that Estequilla could never expect, not even in her nightmares. A group of men were making use of heavy machinery to destroy one of the eleven archaeological mounds registered on the site. Underneath this small mound, a pre-Inca pyramid, four to six meters tall and 2.5 square kilometers, which dates from ancient times. The Archaeological Complex of El Paraiso, one hour away from Lima in the county of San Martin de Porres, is located in an area where there is growing real estate speculation. Discovered in the 1950s, the site remained idle until December 2012, when the Ministry of Culture began to implement the project. As the years went by, the area surrounding the site was gradually taken up as private property. Today, the borderline of the archaeological site is right where the private plots and crops begin. There used to be 12 registered pyramids on the site. The main one had been almost completely restored by Swiss archaeologist Fredéric Engel between 1965 and 1966. In January 2013, the sector responsible for excavations in the Peruvian Ministry of Culture discovered evidence to suggest that El Paraiso is as ancient as the Egyptian pyramids or Mesopotamian civilization. Between 4,500 to 4,800 years old, that would be one of the cradles of our Latin American continent. It is proof that long before the Spaniards, the Church and even Christ, Lima had already become a major capital city. As you leaves Lima, in order to get to El Paraíso, you must take a microbus – a kind of van which outnumbers other means of public transport in Lima – up to the neighboring town of Pro. It is a 40-minute journey through the hectic traffic of the Peruvian capital. From there, two more microbuses which will take you to the car, near the station, driven by one of the members of Association Kapaq Sumaq Ayllu. The landscape is bare, dotted with humble houses. As you arrive at the narrow lane that leads to the complex, you see open air garbage, vultures and children who seek toys amidst the dirt. I observe a wall which hugs the side of the road the entire way. “It’s a wall”, explains Miguel Castillo, field head of the project of El Paraíso, who sits in the rear of the car. Later I would find out that the wall is 30 kilometers long and surrounds the hills in the region. As time went by, it was snatched up along the way by the private buildings and plots. “O Estado é ineficiente. Tem recursos para delimitar e proteger as wakas [sic], mas não o fazem. É igual no Brasil, na Argentina… O que se tem é a iniciativa pessoal de algumas pessoas, de arqueólogos. Mas não é suficiente. Members from the Kapag Association, together with their security people, had been victims of an attack a week before. For safety reasons, a watchman accompanied our group – with the entire team of archaeologists – while walking to the area where the pyramid had been destroyed. The native workers who previously used to be engaged in the excavation, now sit on the top of the hills, watching over. After the pyramid was knocked down, security has been doubled. There are now four policemen who protect the place day and night, as well as two watchmen from a private firm who have been hired by the Ministry of Culture, and they all make a big effort to oversee the whole 45 hectares of land.